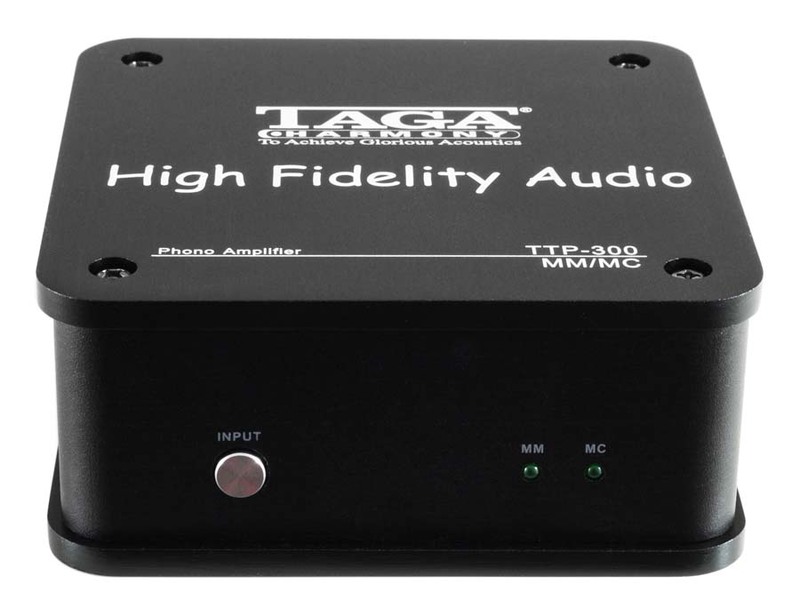 Ian Ringstead checks out the £200 moving coil and moving magnet phono stage from Polish manufacturer TAGA Harmony. 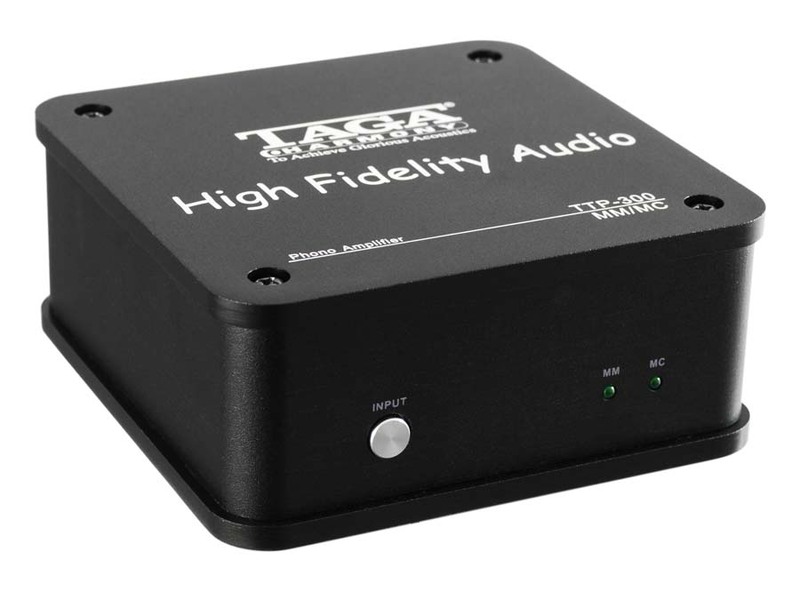 I’ve reviewed TAGA Harmony speakers in the past and when I visited the Polish Hifi show last year I was told by the company that they were bringing out some exciting new products, one of which is this phono stage the TTP-300. The vinyl revival has really caught the imagination of companies in the last couple of years and there is a plethora of new turntables and associated products being produced now to attract old and new enthusiasts to spin their vinyl on and with. 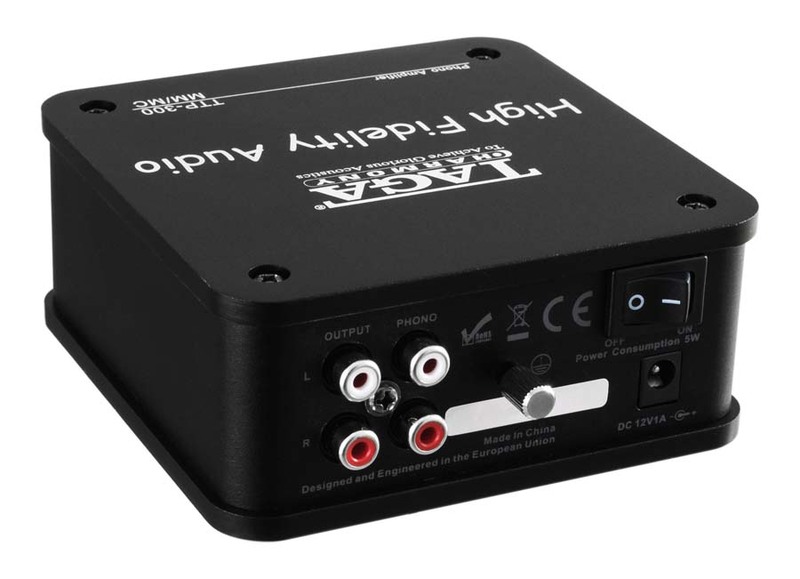 The TTP-300 is neat and small in a very solid aluminium case that is well styled with nicely rounded corners and rubber feet on the base to protect any surface it is stood on. 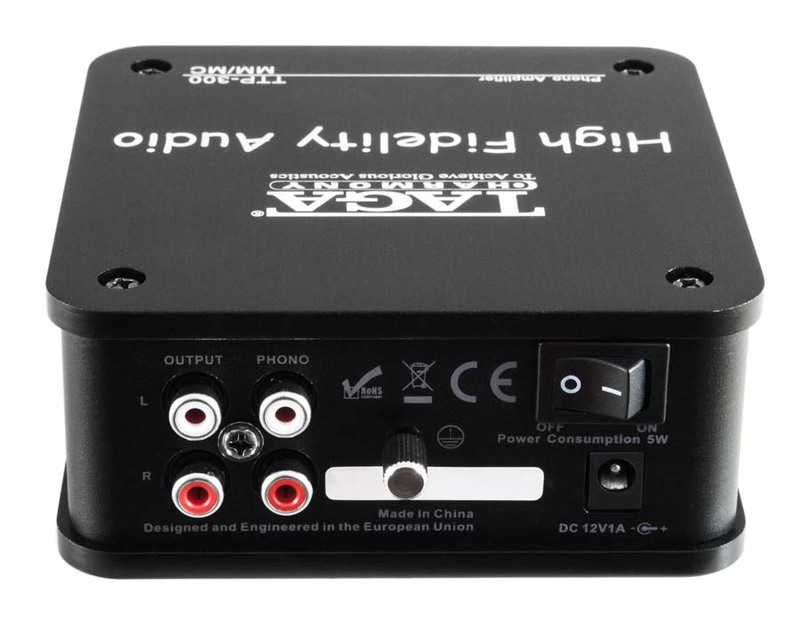 The unit is clearly labeled with the company name proudly shown on the top plate and on the front, there is a selection switch on the left side for the input between moving magnet and moving coil cartridges with a corresponding green led for which one the user has selected on the right of the front panel. On the rear at the top left is the power rocker switch with the 12v dc input socket below for the plug-in mains adaptor. In the centre of the back panel is the earth terminal to ground your arm cable and finally to the left are the two phono input RCA sockets and RCA output sockets being gold plated of course. All beautifully neat and simple. I couldn’t resist taking the top off the box to look inside where I found two well-made circuit boards for the input selection switch and selection LEDs and the main circuit board for the power input and RIAA equalisation and amplification of the signal. The unit is designed and engineered in the EU and made in China to keep costs down so maximising the value for money to the customer. Set up was a doddle (quick and easy) and I left the unit powered up for a few days to run in. Noise level was very good on first using the TTP-300 with no hum and just the usual surface noise inherent with vinyl records solely dependent on the quality of the record of course. I recently attended the annual Record Store Day at a local dealer in Sheffield as it was a great opportunity to hear some new equipment and buy a lot of second-hand vinyl. Of course, I came away with a fair few classic albums, some of which I had had before plus many new ones to delight in. One of these was the Sheffield Labs “James Newton Howard and Friends” direct cut from the legendary US label started in the 1980s. For those of you not aware of this technique, direct cut meant the whole recording of one record side was done in a single take direct to the cutter to make the master lacquer. The musicians were under immense pressure to play perfectly or sing as any mistakes made couldn’t be edited out later. The benefit of this technique was superb dynamics and quality on the recording. Musically this album will not be to everyone’s taste, but I love it and it sounded great via the TTP-300 in my system. The musicians are legendary with James Newton Howard, David Paich and Steve Pocaro on synthesisers and Jeff Pocaro on drums and Joe Pocaro on percussion. All top session musicians meant that the end results would be spectacular, and it is. Putting the musical genre to one side the dynamics are breath taking for a record that you only normally hear in a live situation. My system certainly sprang into life (rather like eating a chili or hot curry for the first time and catching you by surprise) and the TTP-300 did a very credible job of conveying these dynamics with excellent clarity of each instrument. 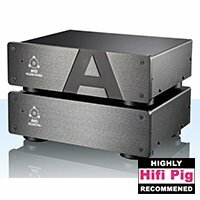 The sound stage had good depth and width with precise location for its price range and although not on a par with my reference phono stage (a Gold Note PH10 which costs nearly seven times as much) it does a sterling job. I then tried another favourite group of mine Acoustic Alchemy who are superb guitarists and I have many of their albums. “Natural Elements” is one of their earlier efforts dating back to 1988 and like all their albums is beautifully recorded. The concept for this album was conceived in a cottage in the New Forest in Southern England using two acoustic guitars and a battered cassette deck. The title track will be familiar to anyone in the UK who is an avid gardener and watches Gardner’s World on the BBC. It was for years the theme tune to this iconic programme and on a good Hifi system sounds sublime. The TTP-300 conveyed the artistry of the two guitarists Greg Carmichael and Nick Webb with great aplomb and the accompanying synthesisers and percussion were all laid out well in the sound stage showing good depth and subtlety. In contrast to the airy and dreamy sound of the title track the track “Evil the Weasel” is far more upbeat and has a persistentdrumbeatt throughout with the guitars duelling along with the synthesisers. The TTP-300 had no problem with the fast pace of this track and unravelled the complex interplay between the instruments very well. As a contrast from instrumental albums I switched to Gloria Estefan and Miami Sound Machine and the 1989 album “Cuts both ways”. She has a beautiful voice as well as looking great and the classic Cuban- American style of her song writing is infectious. I defy anybody not to want to get up and dance to her music. The album is a mix of ballads and upbeat numbers with that Latino vibe running throughout it. Again, a well recorded album the track “Here we are” a well-known single had me transfixed by its simplicity and subtle arrangement. I am a sucker for beautiful women and their voices (I would have no chance if tempted by sirens !!) and music like this is what makes a good hifi system a joy to listen to. 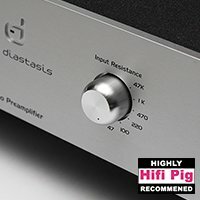 Vinyl is a medium that has always had me in its grip and when a product like the TTP-300 can aid me on this journey I’m happy. As you will have gathered I really enjoyed the TTP-300. 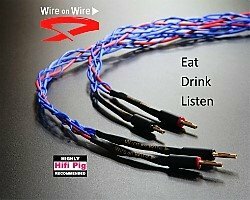 It’s a great plug and play product that is honest and simple. 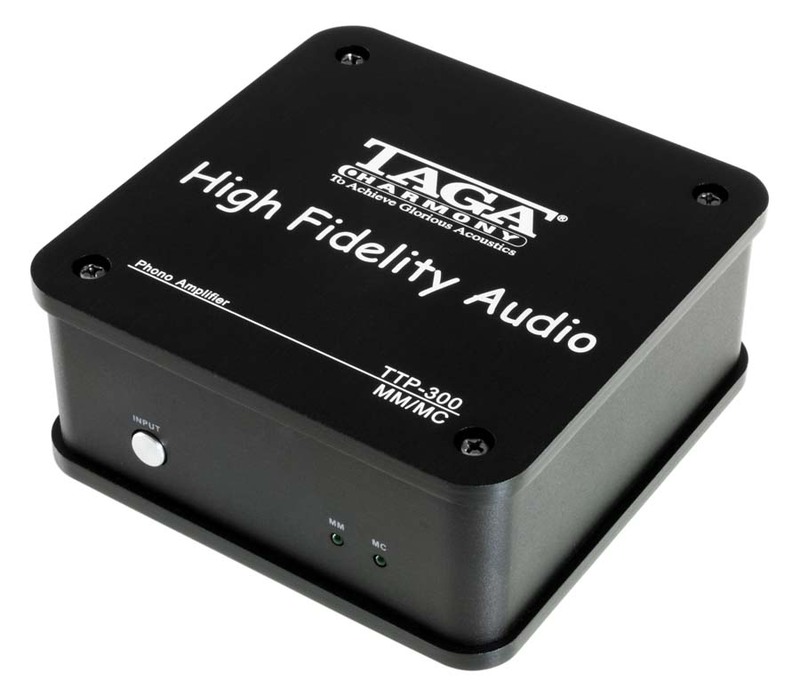 The fact it has both moving magnet and moving coil is a real bonus and it worked so well in my reference system that this is a real attribute to the design. 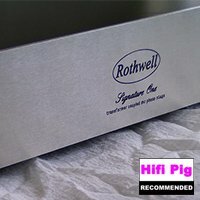 Compared to my reference Gold Note PH10, of cours,e it lacks the magic that a much dearer design brings, and the main differences were that the PH10 added flesh to the bones of the music and made it just that more real and enjoyable. You must bear in mind though that this is not a criticism of the TTP-300 as it ranks highly in its modest price range of £199.95. I used both my Goldring 1092 mm cartridge and Ortofon Quintet Black mc to compare both types and no problems were encountered with either. The Ortofon won out for greater depth and detail but the Goldring is no slouch. Pros: Hum free and low noise design offering mm and mc. Review Equipment: Luxman PD300 turntable with Jelco SA 750 tonearm and Goldring 1092 and Ortofon Quintet Black cartridges, Gold Note PH10, Goldmund copy pre amp, Job 225 power amp, Audio Physic Avanti iii speakers, TQ Ultra Black speaker cables, Way and Missing Link silver interconnects , Hifi Racks Podium Slimline rack.